Marcel Bowman has wide variety of performance and teaching experience. He earned a Bachelor of Music in Violin Performance and Pedagogy from Brigham Young University, a Master of Music in Violin Performance, and a Ph.D. in Music Composition from the University of Utah. 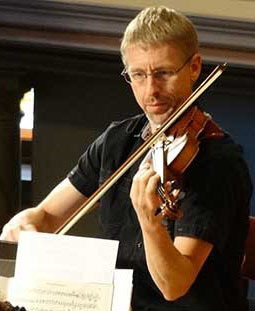 Marcel is a violinist with the Ballet West Orchestra, the Utah Chamber Artists, Sinfonia Salt Lake, and the Utah Lyric Opera and has performed professionally 12 years with the Utah Symphony, among other ensembles in Utah, Idaho and Montana. He is also a regular studio recording artist. Previously, Marcel has taught music courses at Brigham Young University-Provo, BYU-Idaho, the University of Utah, and Snow College, and has coached and directed at several youth music ensembles and festivals. He is currently the Director of Orchestras at Timpview High School. Marcel enjoys performing and recording music with his wife and four children, who are also professional musicians.